Previously we discussed categories with finite biproducts, or semiadditive categories. Today, partially as a further warmup for the axioms defining an abelian category, we’ll discuss monomorphisms and epimorphisms. Monomorphisms and epimorphisms are supposed to be a categorical generalization of the familiar notion of an injective resp. surjective structure-preserving map (such as an injective resp. surjective group homomorphism or an injective resp. surjective continuous function). This idea more or less works out for monomorphisms, but epimorphisms are somewhat infamous for behaving in unexpected ways, and even monomorphisms can behave unexpectedly sometimes. Let be a category. A morphism is a monomorphism or monic if it is left-cancellative in the sense that, if is a parallel pair of morphisms with , then . Monomorphisms are supposed to abstract the notion of an injective function to an arbitrary category. In the category of sets, a function is injective precisely if it is left-cancellative with respect to morphisms from a one-element set, so monomorphisms are injective, and conversely injective functions are monomorphisms by inspection. Identity morphisms are always monomorphisms. If are monomorphisms, so is . If is a monomorphism, so is . is injective. This point of view is particularly attractive, for example, in the category of schemes. A functor is said to reflect a property of something in if, whenever has that property, also has that property. Proposition: Let be a faithful functor. Then reflects monomorphisms. Corollary: Let be a concrete category (a category equipped with a faithful “underlying set” functor ). Then any morphism in which is injective on underlying sets is a monomorphism. Proof. Let be a monomorphism. If in , then because is a monomorphism, and then because is faithful. (Non)example. Consider the category of affine schemes equipped with the underlying set functor sending an affine scheme to its prime spectrum. This functor is not faithful, and so we should not expect a morphism which is injective on spectra to be a monomorphism in general. For example, any field extension is a bijection on spectra, but the corresponding map is not a monomorphism if, for example, has any nontrivial automorphisms that fix (so in particular if the extension is Galois). In most familiar concrete categories, it is true conversely that a monomorphism is injective on underlying sets. To prove this, first recall that a pullback or fiber product of two morphisms with common target is the limit of the diagram . More explicitly, it is the universal object together with projection maps such that . Example. The simplest way to explain the term “fiber product” is to examine what the fiber product looks like in . If are two functions, we should think of them as describing sets “fibered over “: that is, for every element we have fibers . Alternatively, can be thought of as assigning colors to the elements of , which then become colored sets. together with projection maps to inherited from the Cartesian product. Either of these projection maps in turn gives rise to a map to , so one should think of the fiber product as also being a set fibered over , and the corresponding fiber over is precisely the Cartesian product of fibers . So the fiber product is literally the fiberwise product. Example. The origin of the term pullback, if I understand the history correctly, is in the theory of vector bundles. Here the pullback of describes the result of pulling back a vector bundle on some space along a map to obtain a bundle . Somewhat confusingly, the term “pullback” is also used to describe precomposition, and again if I understand the history correctly, this is because specifying the data of a vector bundle over is equivalent to specifying a homotopy class of maps from into a certain classifying space, and then pulling back vector bundles corresponds to precomposing such classifying maps. Some general comments. If a fiber product and an ordinary product both exist, then the former admits a natural map into the latter by the universal property of the product. This map is always a monomorphism, so the fiber product can naturally be thought of as a subobject of the ordinary product. The fiber product can also be thought of as the ordinary product in the slice category of objects over . is a pullback square or cartesian square. Remark. This condition says precisely that the kernel pair of is trivial. This result is therefore a natural generalization of both the familiar fact that a morphism of abelian groups is injective if and only if it has trivial kernel and of our previous discussion of internal equivalence relations. Corollary: Being a monomorphism is a “limit property”: more precisely, any functor which preserves pullbacks (in particular any functor which preserves finite limits, in particular any functor which preserves all limits) preserves monomorphisms. Corollary: Let be a concrete category whose underlying set functor has a left adjoint. Then a morphism in is a monomorphism if and only if it is injective on underlying sets. Proof. The above diagram is a pullback square if and only if , together with projections to and given by the identity, satisfies the universal property of the pullback, which is the following: if is an object with two morphisms such that , then uniquely factor through a map to . But this occurs precisely when . Hence the universal property is satisfied if and only if is a monomorphism as desired. Example. , and many other familiar categories all have underlying set functors with left adjoints, so monomorphisms are precisely injective maps on underlying sets in all these categories. So on the one hand monomorphisms reproduce a familiar notion in these settings and on the other hand the definition of a monomorphism does not depend on a choice of embedding into . The following two (non)examples are from Borceux’s Handbook of Categorical Algebra. for every positive integer by divisibility. Taking sufficiently large gives , hence , hence . Epimorphisms are the categorical dual to monomorphisms: an epimorphism is a monomorphism in the opposite category. Equivalently, a morphism is an epimorphism or epic if it is right-cancellable in the sense that if is a parallel pair of morphisms such that , then . I promise that this section is not just the categorical dual of the previous section. Epimorphisms are supposed to abstract the notion of a surjective function to an arbitrary category. In the category of sets, a function is surjective precisely if it is right-cancellative with respect to morphisms into a two-element set; more precisely, if is a map of sets, we can define two functions where identically and where on the image of and otherwise, and then . On the other hand, if and only if is surjective. Conversely, surjective functions are epimorphisms by inspection. It’s very nice that in the notions of injective and surjective function turn out to be categorically dual. However, for other concrete categories this example is misleading; the argument above makes essential use of the fact that is a subobject classifier in , and many algebraic categories such as groups and rings don’t have subobject classifiers. Identity morphisms are always epimorphisms. If are epimorphisms, so is . If is an epimorphism, so is . Proposition: Let be a faithful functor. Then reflects epimorphisms. Corollary: Let be a concrete category. Then any morphism in which is surjective on underlying sets is an epimorphism. (Non)example. We return to the category of affine schemes. If is a field of characteristic not equal to , the quotient map induces a bijection on spectra, but the corresponding map is not an epimorphism since, for example, it is not cancellable with respect to the identity map and the map sending to . The dual notion to pullback or fiber product is the pushout or amalgamated coproduct of two morphisms with common source. This is the colimit of the diagram . More explicitly, it is the universal object together with inclusion maps such that . This is an important example for understanding nice topological spaces, which can often be thought of as obtained by gluing together simpler spaces. 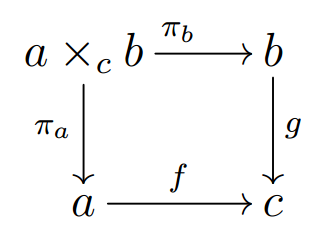 From this perspective, the Seifert-van Kampen theorem can be thought of as the statement that the fundamental group functor preserves certain pushouts (it sends them to the corresponding amalgamated free products of groups). Example. In , the pushout of two morphisms is precisely the tensor product over . From a geometric point of view, we should think of as the fiber product of the two schemes , which are fibered over . Even in the innocuous case , which corresponds to taking the tensor product of rings, this suggests that we should really think of commutative rings geometrically as spaces fibered over (roughly speaking, the primes) and their tensor product as the fiber product over . 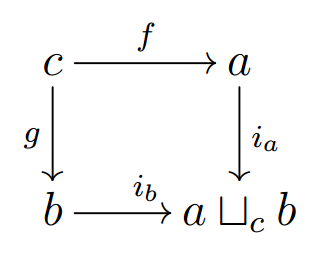 Dual to the corresponding statements for monomorphisms, if an amalgamated coproduct and an ordinary coproduct both exist, there is a natural map from the latter to the former. This map is always an epimorphism, but we should be careful not to be tempted into thinking of epimorphisms as quotient maps in general. The amalgamated coproduct can also be thought of as the ordinary coproduct in the coslice category of objects under . is a pushout square or cocartesian square. Remark. This condition says dually that the cokernel pair of is trivial, which should be regarded as a natural generalization of the familiar fact that a morphism of abelian groups is surjective if and only if it has trivial cokernel. Corollary: Being an epimorphism is a “colimit property”: more precisely, any functor which preserves pushouts (in particular any functor which preserves finite colimits, in particular any functor which preserves all colimits) preserves epimorphisms. Corollary: Let be a concrete category whose underlying set functor has a right adjoint. Then a morphism in is an epimorphism if and only if it is surjective on underlying sets. Now that we’ve dualized everything, we can see what goes wrong with epimorphisms in familiar categories that doesn’t go wrong with monomorphisms: in categories like , etc. the underlying set functor usually does not have a right adjoint because it usually does not preserve colimits, hence there is no reason to expect that all epimorphisms are surjective. Example. 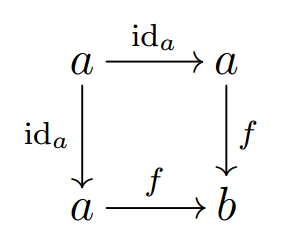 If is a commutative ring, then any localization is an epimorphism. More generally, by the above proposition, a morphism of commutative rings is an epimorphism if and only if the tensor product is naturally isomorphic to . For a thorough discussion about when this occurs, see this MO question. Example. 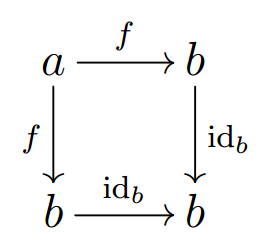 The forgetful functor has a right adjoint sending a set to the indiscrete topology on that set, so epimorphisms in are precisely the surjective continuous maps. This can also be shown using the space with the indiscrete topology, mimicking the argument in . However, the category of Hausdorff topological spaces does not have this property. An epimorphism in this category is instead precisely a continuous map with dense image. To see this, in one direction, if a map has dense image, then any two maps such that agree on the image of , hence agree on its closure by Hausdorffness, hence . Conversely, if a map is an epimorphism, consider the quotient of by the closure of the image of , which is Hausdorff. admits two maps to this quotient, namely the quotient map and the constant map with value the point to which has been identified, and is right-cancellable with respect to these maps if and only if is all of . Edit (10/15/12): The above argument fails; see this math.SE question for the correct argument, which proceeds by computing the pushout. Example. The forgetful functor does not have a right adjoint because it does not preserve coproducts. Nevertheless, it is still true that the epimorphisms in are precisely the maps which are surjective on underlying sets. This is not obvious. For abelian groups this is clear because we can imitate the argument above and quotient by the image, but for groups the image of a group homomorphism may not be normal. The proof instead proceeds as follows. By the proposition, a morphism of groups is an epimorphism if and only if the amalgamated free product is naturally isomorphic to . This requires in particular that for all (where the first lies in the first copy of and the second lies in the second copy of ) and it is a nontrivial fact about amalgamated free products that this can only occur if lies in the image of (roughly speaking because the only relations imposed on the free product come from elements in the image of ). Hi, Qiaochu. Not long ago I found a nice conceptual proof of the fact that epis in groups are surjective, which I’ve written up at the nLab here. I am working on a project, and I need to know the proof of the corollary stating that (Being an epimorphism is a “colimit property”: more precisely, any functor which preserves pushouts (in particular any functor which preserves finite colimits, in particular any functor which preserves all colimits) preserves epimorphisms.) so could you please tell me where I can find the proof for this corollary? Show that a map is an epimorphism iff its pushout with itself is its target. This is the dual of the corresponding proof for monomorphisms, which is given in the post. you have said in the third last paragraph and i quote “consider the quotient of Y by the closure of the image of f, which is Hausdorff. I cannot figure out why this quotient of Y is hausdorff? I actually can’t either! I’ve posted a math.SE question about this.